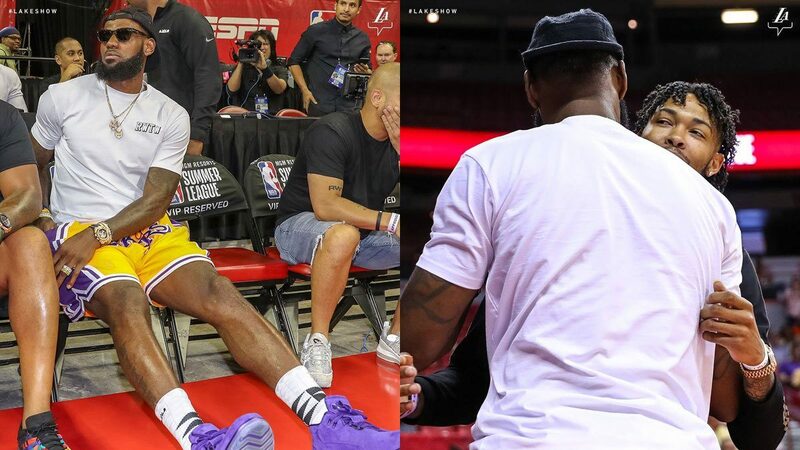 LeBron James was in the building for the first time at the 2018 NBA Summer League to support his new Los Angeles Lakers teammates. The King stopped by the Thomas & Mack Center on Sunday to watch his new team earn a spot in the semifinals of the Summer League. A lot happened when LeBron showed up just minutes before tipoff and we've categorized the good from the bad moments. When LeBron emerged from the tunnel, the crowd went wild to greet him in his first public appearance as a Laker. But then again, most of them might be bandwagoners. LeBron has always had a strong fashion sense especially with his pre-game attires. He’s not known to make bad decisions when dressing up—until now. His throwback Lakers shorts are worth $500 by the way—which is too much money to spend on something that disappointing. Moments after LeBron James was seated, Brandon Ingram and Josh Hart individually walked over to where LeBron was sitting courtside to give him their welcome greets. What are those?! Purple shoes have a unique appeal, which is why you have to be very careful when using them as part of your look. LeBron, however, feels like he just put it on to complete his tribute ensemble for his new team. This lucky fan got the chance to take a half-court shot and nailed it. He gets a nod and a point from King James for his trouble. Notorious LeBron hater, sports analyst Skip Bayless tweeted this after seeing LeBron saunter to courtside. We don’t know what his point is or why there was a need to tweet that. After the Lakers victory against the Detroit Pistons, Tyronn Lue, who was in the crowd waiting for the Cleveland Cavaliers turn to play the Toronto Raptors, approached LeBron and the two had a pleasant exchange.